Sparta didn’t achieve its leading military status in the 5th century BC without getting into some battles. The many Spartan battles over the years have been heralded as some of the most unique, interesting and bloody skirmishes and wars to have been fought in ancient times. The battle of the Spartans were many, including the Messenian wars in the 7th and 6th centuries, the Argive wars spanning the 6th to the 4th century BC, joined by the Arcadian wars in the 5th and 4th century, also overlapping with the Megaran war in the early 5th century. We plan to detail some of the most interesting battles from these times, and help you to understand better the tales from the battlefield in Spartan times. Beginning in 743 BC and spanning the next twenty years, the first Messianic War was a war the Spartans eventually won. The war itself was reported to have started over the Spartan desire for the Messenian land. Of course the long drawn out battle was for the Spartans to win, they already had an established military, even though they were outnumbered by the Messenians. The Messenians would eventually become secondary to the Spartans and classed as helots, used for farming and producing crops for the state of Sparta. This sat unwell with the Messenian people for around forty years, when finally their revolt caused the second Messenian war, which Sparta would win again after another seventeen years of war. The Persian wars were a huge battle over fifty years between the ancient empire of Persia and the ancient Greek city states. The battle that perhaps defines Sparta in the eyes of many is the Battle of Thermopylae where the mighty King Leonidas held off the impending Persian army at the pass of Thermopylae, which they would eventually lose. The involvement of the Spartans in the Persian wars was marked by Sparta’s reluctance to travel too far from its home. With the rising power of Athens and the Delian League the strong formation of the Peloponnian League designed to combat it would eventually come to war. The first ushering of this war started around 431 BC and lasted for nearly thirty years. The Peloponnesian War saw the members of its league battle against the Athenian forces, with Sparta pushing Athens from the top of the chain to a dishevelled state, which saw Sparta emerge as the dominant power in ancient Greece. The Peloponnesian War wasn’t without its casualties though, the battle took a heavy toll on all of ancient Greece bringing many regions, and cities to their knees. The battle of Leuktra is one of the most important battles in the history of Ancient Sparta, and saw Thebans and the Spartans go to war. 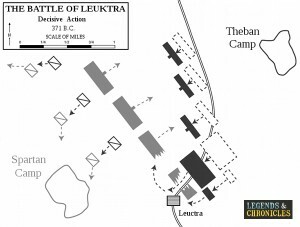 The battle would of course take place in Leuktra and was the results of the combined forces of Athens, Thebes and many others opposing the power of Sparta and its government. A new league was thus formed by the opposers to Sparta, named the Boeotian league which was led by Thebes. In retort Spartans attacked the Boeotians but the war dragged on slowly with no real conclusion. It was only when a peace meeting was suggested that things moved forward, however for Sparta the signatures of all the Boeotian states were not presented for the document and it was never agreed upon by Sparta and the Thebans. After this war would ensue and a legendary battle between the Spartans and Thebans/Boeotians occurred with the Thebans emerging victorious. The end result of the battle or Leuktra was that the power of Sparta was broken, the one mighty military state no longer held the power it once did. Not only were the Spartans superb on the battlefield as fighters, they were also excellent tacticians. More so belying their well deserved reputation as efficient, composed and strong warriors, they were also excellent peacemakers and allies. The Spartans were involved in many a well documented battle and won a few too.